Of Oliphant, peacefully surrounded by her family at Grey Bruce Health Services Wiarton on Friday July 10, 2015. Eunice Edith Clemens (nee Carter) at the age of 76 years. Loving wife of Ken. Cherished mother of Steve (partner Mary), of Owen Sound, Debbie (Jeff Coady), of Oliphant, Amanda Clemens, of Toronto, Rob (partner Helen), of London, and Sara Clemens, of Collingwood. Proud grandma of Samuel and Timothy Clemens, Mathew and Michael Coady, and Mataia Clemens. Fondly remembered by her daughter-in-law Karen Clemens; and sisters-in-law Fern Hogan and Louise Carter. Eunice is predeceased by her parents James and Irene; brothers, Ross and Walter Carter; and brothers and sisters-in-law Wes Clemens (Vieno), Alice Donnelly (Gord), Ruby Deakins (Bill), and Harriet Skene (Bud). Eunice was a proud member of the Oliphant Women’s Institute. 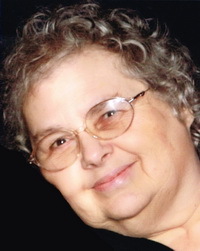 Family invite friends to gather with them for visitation at the Thomas C. Whitcroft Peninsula Chapel, 272 Berford St., Wiarton (519) 534-5341 on Wednesday, July 15 from 2-4 and 7-9 pm, where a service to celebrate Eunice’s life will be conducted from the chapel on Thursday morning at 11 o’clock. Cremation to follow with interment in Balsam Grove Cemetery, Oliphant. Donations to the BPHS Foundation would be appreciated.